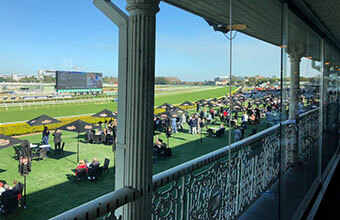 Our signature race day was again held in the Champagne Bar at the Australian Turf Club, Randwick. The function was well supported and we wish to sincerely thank our guests and sponsors. We enjoyed a full race program and the Champagne Bar looked beautiful overlooking the racecourse. Our Treasurer Maureen Thornett was MC and the day went smoothly. 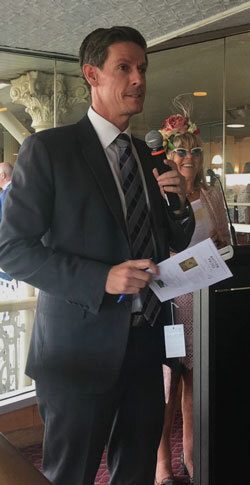 Ryan Clifton, auctioneer presided over our auction and Neil Grigg, milliner chose the best dressed lady and gentleman. Our Guest Speaker was Robyn Lamb, Co-Head of the Child Protection Unit at Westmead Children’s Hospital who has had a long and varied career in the area of Child Protection. We appreciated her insight into the difficulties they face and their appreciation of the contributions made by Cornucopia over many years. The ATC and staff provided us with good service and a beautiful lunch and wine was plentiful all day with thanks again to De Bortoli Wines. In all, a very pleasant and successful day.